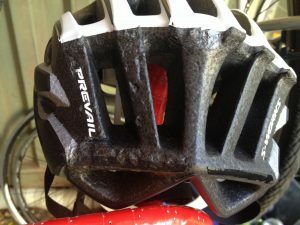 A question I often get asked by customers who come to the bike shop where I work is, “When should I replace my bicycle helmet?” And the answer is often fairly long. In Australia we are required by law to wear an Australian-approved bicycle helmet while riding, but many people use very old helmets, or ones that are very worn or even compromised by an impact. So here’s a few tips to help you decide when you need to upgrade your helmet. Excuse the pun, but it’s a no brainer to replace a helmet once it’s been involved in an impact, like an accident where you hit your head. I was recently involved in an accident and replaced my helmet after a quick inspection showing significant damage to the back of the helmet (see photo). But it’s not always so obvious. I actually don’t remember if I hit my head, but I’m taking the damage as evidence that I did, and throwing it away. My helmet was only a few weeks old and cost $350 but it still had to go. I also included it in my insurance claim so can now afford a brand new one. Shell – Look for cracks or abrasions. Are there any cracked edges? Check for fading because UV exposure can make the shell brittle. Any compromise to the integrity of the shell will mean it may not hold together in an impact. Liner – The foam. Press carefully over the shell of the helmet to see if there is any movement. In some helmets there will be no movement and in others a little movement, You should look for any area where there is a variation in movement compared to the rest of the helmet. An area of greater movement indicates damage to the foam under the shell. Turn over the helmet and check the liner for cracks or compressed foam. If you suspect any area of compression, check and measure the thickness of the foam at the same spot on the other side of the helmet. If you feel any dents, indentations or gouges, it’s time for a replacement. Straps/buckles/clips and fasteners – check for wear and tear. Any loose stitching or fraying? Check buckles/clips and fasteners. Do they work and hold? Buckle or fasten and then give them good forceful tugs and twists to check they don’t come apart. Think about the force they would be under during an impact, or multiple impacts like a car, and then the road. You want to mimic that force, you need to know that they will work to keep that helmet securely on your head in an impact. The US body the Snell Foundation and many helmet manufacturers recommend that you replace your helmet every five years. The Snell Foundation says that glues, resins and other materials used in helmet production can affect liner materials. Plus hair oils, body fluids and cosmetics, as well as normal “wear and tear” all contribute to helmet degradation. Petroleum based products present in cleaners, paints, fuels and other commonly encountered materials may also degrade materials used in many helmets possibly degrading performance. There are also preventive measures you can take to increase the lift of a helmet. Drastic changes in temperature and excessive exposure to UV light can degrade EPS foam, causing it to harden and become brittle. Don’t store your helmet in your car and keep it out of direct sunlight when not in use. Keep your helmet away from solvents and other compounds that you may store in the same location as your bike gear. And keep your helmet out of harm’s way when applying spray-on sunscreens or bug spray, as both often have some mixture of these ingredients in them. Human sweat can be quite corrosive and will break down EPS foam over time so washing your helmet on a regular basis can also help. Please share your tips on “When should I replace my bicycle helmet?” via comments or the Women Who Cycle Facebook page. Next Post:How do I get my partner to ride with me?